Usain Bolt’s failure to win both the 100m and 200m finals at the Jamaican Olympic trials last week has become a major talking point in world athletics. The hero of the 2008 Beijing Olympics was completely outclassed by his Jamaican teammate Yohan Blake, who was the victor in both events. The prospect of an Olympic upset is being discussed among fans and critics alike. Alarm bells are ringing. However, the regular followers of Bolt will know that he likes to save his best form for the biggest stage. The 100m world record holder will be looking to run significantly faster than 9.86 seconds when he lines up to start in London. There is no doubt that Bolt’s attempts to break the world record again will be grabbing all of the headlines before the start of the games. However, with Yohan Blake recording a time of 9.75, the fastest time this year, the 100m final could be the most closely contested and fastest final ever seen at a major championships. At 22 years of age, Blake looks ready to stamp his authority amongst the sprinting elite. His rise to the top would not surprise those who have followed him closely. Now the fourth fastest man ever, he still holds the record as the youngest sprinter to run under 10 seconds, which he completed at 19 years and 196 days. Tyson Gay is another potential threat to the Jamaican monopoly in this race. He has had a remarkable return to athletics after undergoing hip surgery last July. The American’s race to become fit for London 2012 has not been smooth but he has recorded a time of 9.86 seconds this year, equalling Bolt’s performance in Jamaica last week. Gay will be looking to improve and will have gained some confidence after racing without his previous injury affecting him. Asafa Powell completes the speedy Jamaican trio. He is on the narrow list of names that have beaten Bolt since his historic win in 2008; Yohan Blake and Tyson Gay complete that distinguished list. His time of 19.88 at the Jamaican Olympic trials still keeps him in contention at the very top. 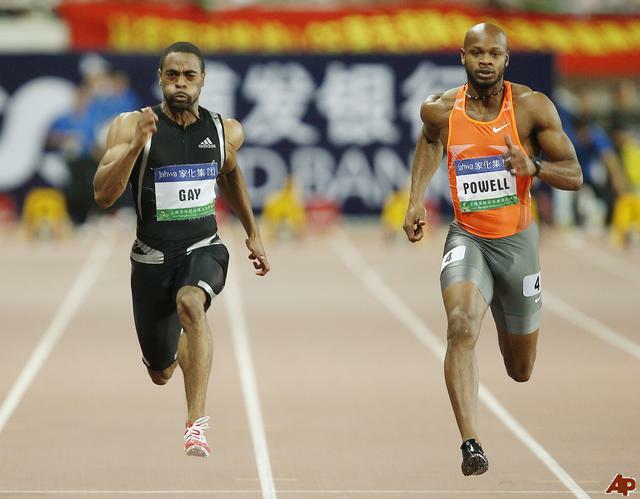 Tyson Gay an Asafa Powell are two of the favourites to beat Usain Bolt. This is not to say that the emphasis has moved away from Usain Bolt, far from it. He is the most recognisable face in world athletics and has stepped into the spotlight with ease since his rise to fame in 2008. The media frenzy around Bolt has been quite remarkable but if he were to record a significant loss in the 100m final at London 2012, his heroic status would certainly be tarnished. More questions have been asked after his infamous false start at the World Championships. 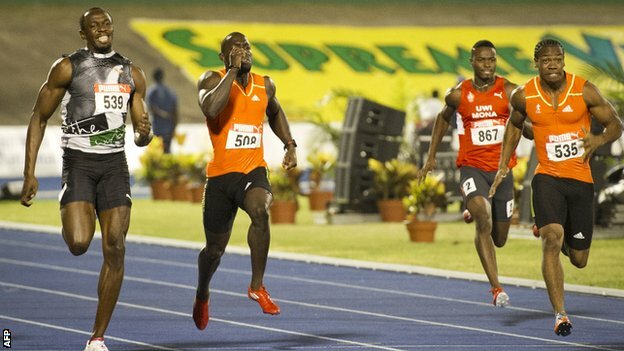 Fans want to see competition and if Yohan Blake can provide a shock upset, it may establish a genuine rivalry in the sport, encouraging others to follow. A closely fought race between Bolt, Blake, Powell and Gay would be the ideal scenario, with all four running at their best. 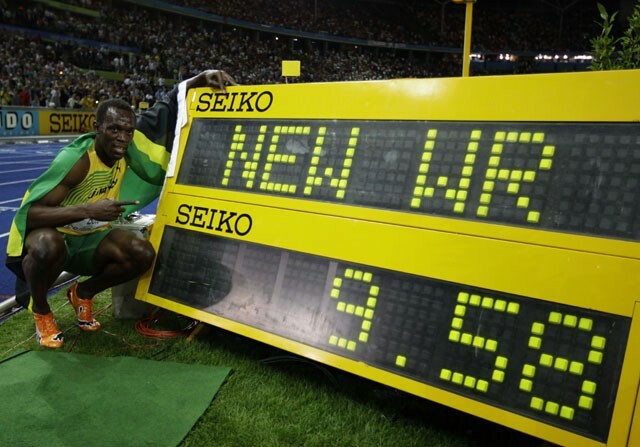 Usain Bolt in 2009 after his world record time. Count me in with the group that thinks he’s saving his best for London. We were thinking that when he ran in Beijing, four years ago.